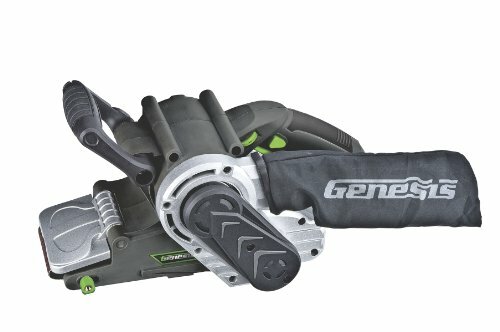 Genesis' 3 x 21-Inch Belt Sander, Model GBS321A, combines power and versatility with ease-of-use features and less noise for fast and efficient stock removal. It is designed for woodworkers, carpenters, furniture makers, floor installers, deck builders and general contractors who require an excellent Belt sander with predictable results. The GBS321A features a powerful 8.0 AMP motor with an electronic speed control to ensure constant speed under load. The variable speed control dial allows the user to match the speed (390-1,180 ft./min.) to the desired application. -Auto-tracking belt system that tracks the belt without adjustment and an adjustable Front Grip Handle for comfortable Operation and Control. -Low profile design provides incredible balance and allows you to get into tight spots and corners. -Long 6.5-foot power cord to allow you to complete larger projects with ease. -Highly efficient dust collection bag to reduce dust in the work area. The GBS321A is engineered for woodworking and cabinetry and is perfect for sanding wood panels, furniture, closets and more. Add the Genesis GBS321A Belt Sander to your tool collection today!